RCA Ozawa "complete" RCA Recordings????? RCA has announced "The Complete RCA Recordings" of conductor Seiji Ozawa in a boxed set of six (6) CDs. That cannot possibly be correct. 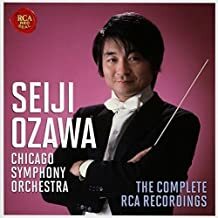 They may be all Ozawa's "Chicago Symphony Orchestra" recordings, however, RCA specifically states his "complete RCA recordings." For one example, Ozawa recorded the Schumann Piano Concerto and Strauss's Burleske for Piano and Orchestra with the London Symphony Orchestra, Leonard Pennario, pianist. I have that stereo LP. Am I missing something here ... maybe there are other RCA recordings (I haven't checked my LPs yet to make that determination). Is it possible this was recorded by Decca, EMI or some other label to be released by RCA Victor? However, at this time, Pennario himself was under contract to RCA. Re: RCA Ozawa "complete" RCA Recordings????? I understand it as the complete RCA Ozawa/CSO recordings. That coupling was indeed published by RCA Victor on LP. But Leonard Pennario was an exclusive Capitol (i.e. EMI) artist, wasn't he? So maybe the recording was actually made by EMI for RCA Victor, just as many others were made by English Decca for RCA. Or it could just be a slip-up. After Pennario left Capitol/EMI, he recorded exclusively for RCA Victor, hence the Heifetz collaborations, work with the Boston Pops, etc. I think this is an RCA slipup since the new Ozawa box (which does not particularly interest me unless the Pennario was in it) specifically states Ozawa's "complete" RCA recordings. Perhaps this is meant to be volume one, but does not state that on the box. It will be interesting to see how this turns out and if anyone else makes the observation. Like Mr. Johnson, I took this to mean Mr. Ozawa's CSO recordings for RCA. It's part of a series that started with the release of Reiner's recordings in Chicago, continued with those of Jean Martinon, Morton Gould and now Seiji Ozawa. James Levine can't be too far away. Whether we see the CSO recordings of Frederick Stock, Desiré Defauw or Artur Rodzinski is another matter. I'm looking forward to getting this set by the young Ozawa. He was quite the star while Music Director of the Ravinia Festival. I haven't heard them all, but those I have heard are very satisfying. Well, John, you make a point, though my first impression was his "complete" RCA recordings. It is just a slightly bit misleading in my estimation. You may have piqued my interest in acquiring this set after all! And, of course, I would delight in having Stock's and Rodzinski's recordings in one box, masterfully digitized. Next, it might be nice, too, to have the complete RCA recordings of the Boston Symphony with Koussevitzky. I'm afraid some of these names don't "sell" today. The younger set seems not to know -- or care of know -- the grand masters of yesteryear. And Defauw, too, would be of some interest. There seems to be a lot of interest in Ozawa's recordings today with a quite a few themed boxed sets available. So RCA/Sony issuing a complete recording collection might still come to pass. As a young conductor in Chicago (actually Highland Park where Ravinia Park is located), Ozawa was associated with 20th century music and his discography is primarily late 19th and 20th century music. 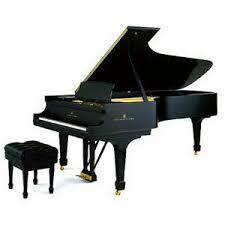 Only recently has he completed Beethoven and Brahms cycles in Japan.